Today is a Holy Day of Obligation, as we celebrate the Immaculate Conception of Mary. 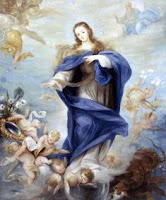 We are encouraged to hear Mass and pay homage to the Immaculate. The Gospel today speaks of the announcement made to Mary by angel Gabriel that she would conceive a child whom she would later name Jesus. Mary was engaged with Joseph then, and I would imagine that the news of this unexpected event created much confusion and trouble in Mary's mind. I mean, it isn't often that an angel of the Lord would come and visit you, right? =) And it was just impossible, or so she thought. But when the angel told her that nothing is impossible with God, I bet the next emotion Mary felt was utter fear. The thought of bearing a child unwed was simply not acceptable in the society. She would probably be treated a prostitute and be stoned to death by the people. But the angel Gabriel reminded her that the Lord is with her. She took comfort in this and must have realized that, though this was a big role being given to her, it was more of a priviledge. Mary then surrendered her life to being the mother of Jesus and our mother. I believe that Mary was just like the rest of us. She was living a simple and quiet life when she was suddenly tasked with a huge responsibility. We are also huge roles to play in life: it may be an unexpected promotion, a huge project, or becoming a parent. At first, we may feel that we are undeserving or that we are incompetent. We may think that the task is impossible to finish and the goal is impossible to reach. We may want be afraid and unsure if can do it. But Mary is setting an example for us. Though she was afraid and the not sure of what her future would be after bearing Jesus, she took the situation as a blessing and just gave God the driving wheel of her life. We are encouraged to be the same. We may not initially understand certain things that happen to us. We may be afraid of what the future holds. We may feel that we just cannot do what needs to be done. But let us follow Mary's example. Let us take each situation, whether good or bad, and each responsibility, whether huge or small, as a blessing and a priviledge to be of service to God. Let us surrender whatever fears and insecurities we have to God. I would like to think that, when angel Gabriel said, "For nothing is impossible with God," not only was he pertaining to the Immaculate Conception, he was also saying that there is nothing God cannot do if we only ask Him.